This chapter’s focus lies on James Baldwin’s Giovanni’s Room (1956). While the novel has received much critical attention, age and aging have been mentioned only in passing by scholars. Hess illustrates that themes of age and temporality crucially shape the narrative. 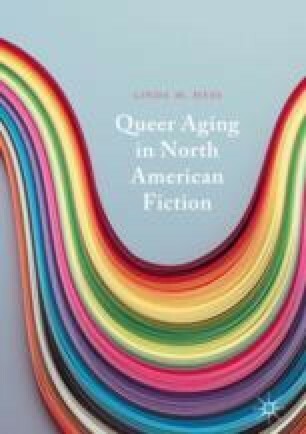 She examines the novel’s central binary oppositions that function on the basis of age relations: the dichotomy of young, “pure,” heteronormative America versus old, permissive, decadent Europe, and the dichotomy of youthful, heterosexual masculinity versus aging, gay effeminacy. In the context of the Cold War era’s fixation on young hetero-masculinity, the figure of the aging gay man embodies the protagonist’s greatest fear: irrevocable failure—that is, exclusion from a meaningful life course—and exemplifies the discursive power of the heteronormative timeline to erase queer futurity. ———. 1973. Homosexuality and Sexual Orientation Disturbance: Proposed Change in DSM-II, 6th Printing, Page 44. The American Psychiatric Association. https://dsm.psychiatryonline.org/doi/abs/10.1176/appi.books.9780890420362.dsm-ii-6thprintingchange. Accessed 2 Feb 2014. Chase, Jennifer. 2004. Berlin. In glbtq: An Encyclopedia of Gay, Lesbian, Bisexual, Transgender, and Queer Culture, ed. Claude J. Summers. https://glbtq.com. Accessed 9 Oct 2012. Farmer, Brett. 2004. Paris. In glbtq: An Encyclopedia of Gay, Lesbian, Bisexual, Transgender, and Queer Culture, ed. Claude J. Summers. https://glbtq.com. Accessed 9 Oct 2012.